The Baltimore Colts hosted the Buffalo Bills on December 12, 1948 in a playoff to determine the winner of the All-America Football Conference’s Eastern Division. The Colts had forced the playoff a week earlier by defeating the Bills soundly by a score of 35-15 in the regular season finale, with the clubs thus finishing in a dead heat at 7-7. The records were mediocre, to be sure, and they benefited from the collapse of the New York Yankees, who dominated the division in the AAFC’s first two seasons. But it still meant a chance to play in the league championship game – even if that meant facing off against the powerful, and undefeated, Cleveland Browns. The Bills, coached by Red Dawson, actually had a better record in 1947, when they finished second to New York. QB George Ratterman (pictured above) was the key player on offense and had a productive receiver in end Al Baldwin, who caught 54 passes during the regular season. HB Chet Mutryn was an outstanding all-purpose back who led the AAFC with 2288 total yards and 96 points and FB Lou Tomasetti ran effectively between the tackles. Baltimore, under Head Coach Cecil Isbell, was the more surprising participant in the contest. The Colts were coming off a 2-11-1 campaign in ’47. Added to holdover HB Billy Hillenbrand and end Lamar Davis were a fine rookie crop that included QB Y.A. Tittle, HB Bob Pfohl, DHB Jack Leight, and FB/PK Rex Grossman. The team had won three of its last four games, including the convincing win over Buffalo, and appeared to have the momentum heading into the playoff. There were 27, 327 fans on hand at Babe Ruth Stadium. The Colts took the early lead on a 16-yard field goal by Rex Grossman in the first quarter. George Ratterman tossed a five-yard jump-pass to end Bill O’Connor to give Buffalo the lead at 7-3, which was the score at halftime as the defenses controlled the game. The Colts appeared to take command in the third quarter. A 71-yard drive ended with FB Bus Mertes running for a touchdown from nine yards out. Baltimore then put together an 88-yard series that also ended with a Mertes TD, this from a yard. Both were followed by Grossman extra points and the home team was up by 17-7 heading into the final period. Five minutes into the fourth quarter, Buffalo’s Ratterman passed to HB Bill Gompers, who was all alone for a 66-yard touchdown, and with Graham Armstrong’s PAT, that narrowed the score to 17-14. A key play occurred with five minutes left on the clock when Chet Mutryn caught a short pass from Ratterman, but then dropped the ball. Tackle John Mellus recovered what he – and many of those present – thought was a fumble for the Colts, but sideline judge Tommy Whelan ruled it an incomplete pass. Six plays later, with the Baltimore defense reeling following the disputed incompletion, the Bills scored when Ratterman connected with Al Baldwin for a 25-yard touchdown. Armstrong tacked on the extra point. Buffalo’s lead was padded when LB Ed “Buckets” Hirsch intercepted a Tittle pass and returned it 20 yards for a TD. The final score was 28-17 as the Bills won the Eastern Division title. The Colts outgained Buffalo (393 yards to 297) and had far more first downs (24 to 11). Both teams were productive on the ground, with the Colts rushing for 176 yards to Buffalo’s 162. Each team turned the ball over three times – although a turnover-that-wasn’t was the most discussed play of the game. George Ratterman completed 10 of 18 passes for 135 yards and three touchdowns with one interception, and was at his best with the game on the line in the late going. Lou Tomasetti led the Bills with 56 rushing yards on 12 attempts and Chet Mutryn was right behind with 54 yards on 11 carries. Bill Gompers had 52 yards on 14 rushes and, with his 66-yard scoring catch, led the club in pass receiving yards. Al Baldwin and Bill O’Connor each caught three passes, for 21 and 20 yards, respectively, and one TD apiece. For the Colts, Y.A. Tittle was successful on 17 of 36 throws for 217 yards with no TDs and one intercepted. Bus Mertes, who scored the two third quarter touchdowns, ran for 73 yards on 15 attempts and Bob Pfohl contributed 63 yards on 16 carries. 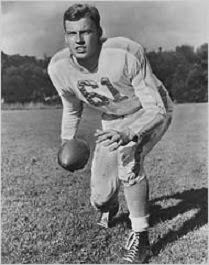 Billy Hillenbrand, who ran six times for five yards, was the top receiver with 7 catches for 75 yards. Lamar Davis had 73 yards on his 5 pass receptions. The come-from-behind win over the Colts did not translate into an upset in the AAFC Championship game for Buffalo. As expected, the Bills were routed by the Browns, 49-7, who won their third consecutive league title. Buffalo went 5-5-2 in 1949 and made the postseason again in the restructured league’s final season, again falling to the Browns in the first playoff round. Baltimore, however, dropped to the cellar with a 1-11 record.